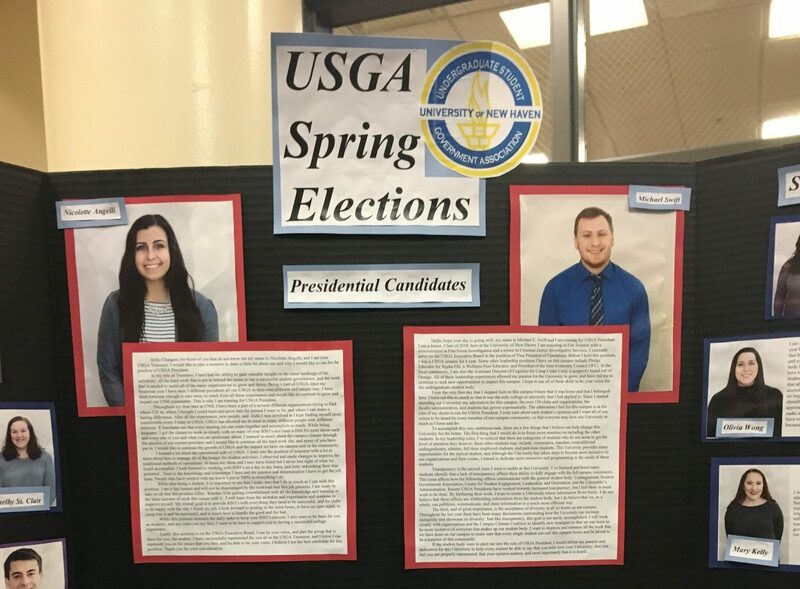 Current USGA Treasurer, Nicolette Angelli, and current USGA Vice President of Operations, Michael Swift, answered questions in a debate before their peers to see who would be the best candidate to be Undergraduate Student Government Association President. Moderated by current USGA President, Samantha Moul, the two candidates each gave their pitch to a moderately-filled Alumni Lounge for what ideas they would bring to the organization. “It was on my first tour here that I fell in love with this campus,” Swift said. He added that once he started giving back to the university and joined USGA, he fell in love right away. Both candidates spoke about getting students more involved with USGA, and getting USGA more involved with campus affairs. Angelli brought forward her plans to have more trainings and guidance for House Representatives and Senators in order to better perform their duties, as well as expanding those duties to reach farther than student organizations. Swift described his experience working with both legislative bodies this year – his prime duty – and how holding the group to higher standards and streamlining some of the weekly duties to make life easier for those members. The topic of campus climate came up early in the debate, as it has become a popular topic among administration and student organizations. “We don’t have to agree on everything, but we’re all students here. We’re all Chargers. And at the end of the day we’re all here for an education,” Angelli said. Angelli added that a personal touch to every day encounters will lead to improved civility when having the “hard conversations.” She also added that she makes a conscious effort to educate herself as much as possible. Swift stressed the importance of being involved with the discussions that happen on campus and said he planned on holding more events that deal with campus climate. When asked about how to achieve increased participation in USGA, the two differed on how to get the best results. Swift had a measured approach, focusing on improving current USGA standards and holding the organization to a higher standard in order for people to take it seriously. “I feel like if people realize that their positions are a lot more important, and that they have a lot more say…the complacency will start to fall down,” he said. Angelli took a more direct approach, proposing to change some of the USGA procedures, including replacing inactive committees with new ones to address issues like parking, residential life, and other hot-button student issues. “A lot of the committees we have, we have them because we’ve had them before and they might be a little outdated or have no use now,” she said. Swift rebutted part of her plan, saying that he doesn’t think removing committees is the right idea, but rather editing them to reflect their current function. After the initial questions, Moul read out questions submitted by students in attendance. One question was how to involve students that aren’t in an RSO in which both candidates had different responses. Angelli expressed wanting to start targeting incoming students before they even step foot on campus at SOAR. Swift wants to target students that may not be as likely to join USGA already like commuters and International students. Another student-asked question was about free speech on campus, and addressed directly the controversy that occurred last semester, addressing diversity of thought. “I think diversity of thought is a super important concept of diversity that we forget about,” Angelli said. She went on to say that it is important to talk to people with different opinions and that it can either lead to changing someone’s mind or reaffirming your own opinion. Swift agreed, saying he wouldn’t disinvite a controversial speaker and that those types of conversations are important to have. “A large issue on this campus that we need to work on is an acceptance of different opinions,” he said. Each candidate ended the debate by sharing their favorite USGA memory and how it inspired them to run for the top seat. Coincidentally, they both shared their first memory in which they realized they could make a difference. For Angelli, it was her first meeting and watching the leadership of a past president. For Swift, it was speaking for the first time as a Senator and sharing his opinion for a vote. Moul sees tremendous potential in each of these candidates. She hopes that they each express the passion and dedication it takes to be successful in the position. She thinks Angelli and Swift are both personable and kind and hope that they can not only be passionate themselves, but inspire others to feel it too. The next USGA President Debate is Wednesday, February 22 at 9:00 p.m. in the Alumni Lounge.